For anyone considering a high quality new vacuum one brand name springs to mind. 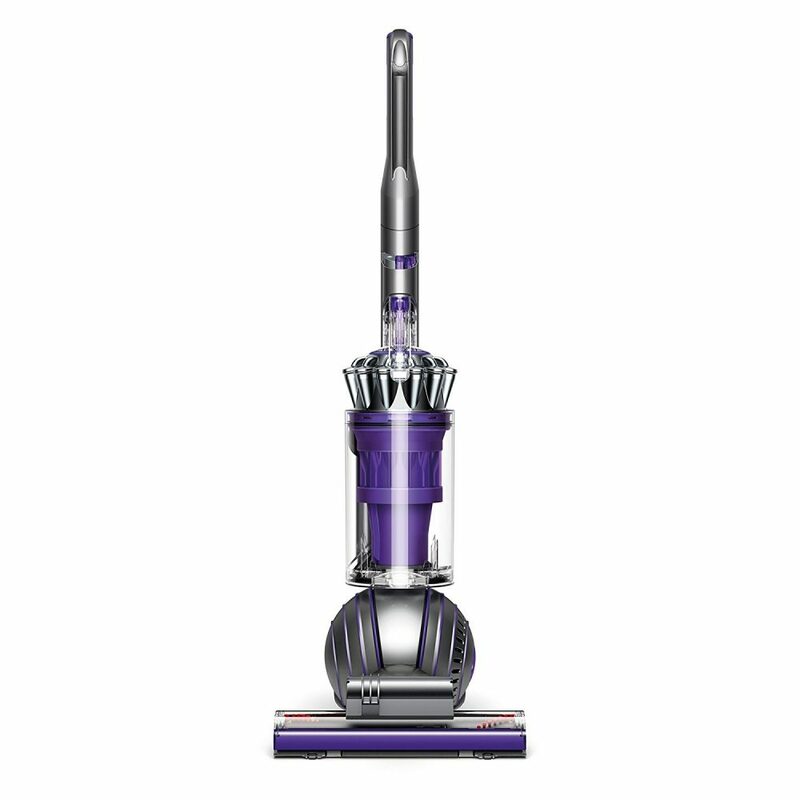 Dyson is a premium brand and of course that means their products come at a premium price. But are you paying for the name or does this vacuum really deliver? As the name suggests the Dyson Ball Animal 2 Upright is a new version of the Dyson Ball Animal that has been on the market for a few years. We’re reviewing this cleaner because it is a recent upgrade. And in terms of practicalities it sits halfway between the Cinetic Big Ball (powerful but larger and heavy) and the Small Ball (lighter but smaller capacity and no HEPA). The Dyson ‘ball’ design that looked so revolutionary 20 years ago seems familiar now. But it still gives the machine a sort of futurist industrial look that I really like. 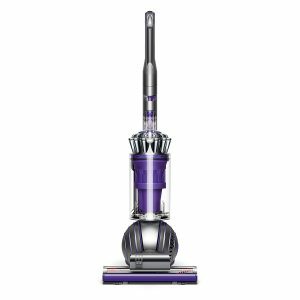 This combined with a big splash of purple – one of my favorite colors –means this vacuum was always going to get a big tick from me in the looks department. This is where Dyson has always excelled. 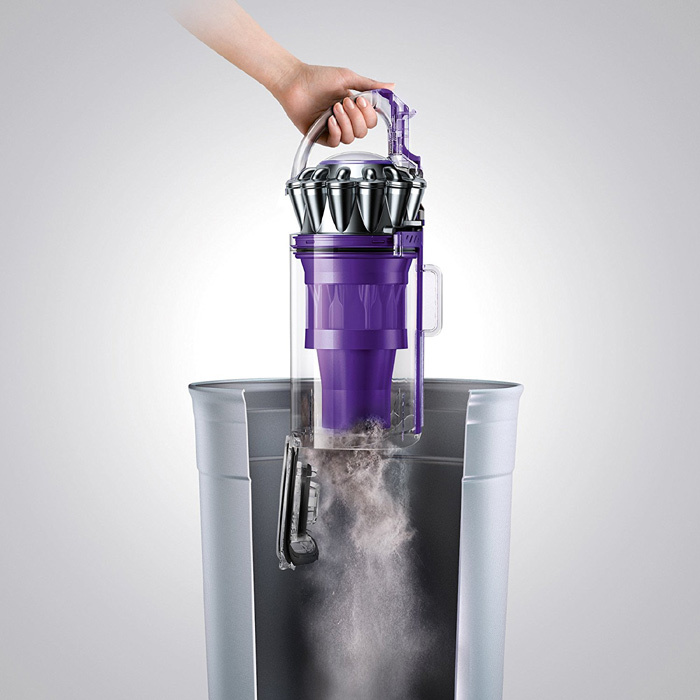 Dyson’spatented cyclone technology captures more dirt per watt of power than any other cyclone. This vacuum delivers all the suction you’ll need – with plenty to spare. Of course, suction is only one element in an effective vacuum cleaner. The design of the brush is also critical for dislodging dirt that can then been caught in the airflow. The Brush bar on the Dyson Ball Animal 2 has had a 20% increase in power over the original (which was already very good). This means it can drive even more dirt and dog hair out of your carpet. The brush roll is well designed to minimize the amount of dog hair tangling and is incredibly powerful. It really beats into the carpet and drives the cleaner forward. But thepièce de résistancefor us pet owners is the fabulous tangle free turbine brush. This brilliant tool makes it so quick and easy to clean dog hair from stairs and upholstery. It is without doubt the best tool of its kind for animal hair. We know this cleaner is powerful and incredibly effective at removing dog hair. But its biggest strength may also be its biggest weakness. In some homes this cleaner will be just too powerful for its own good. Even on the lowest suction setting it takes real effort to move it over very deep pile carpet (like shag pile). And those with light scatter rugs will find they get stuck on the brush head. The cleanerhas been commended by the Royal College of Chiropractors in the UK for preventing musculoskeletal discomfort while vacuuming. 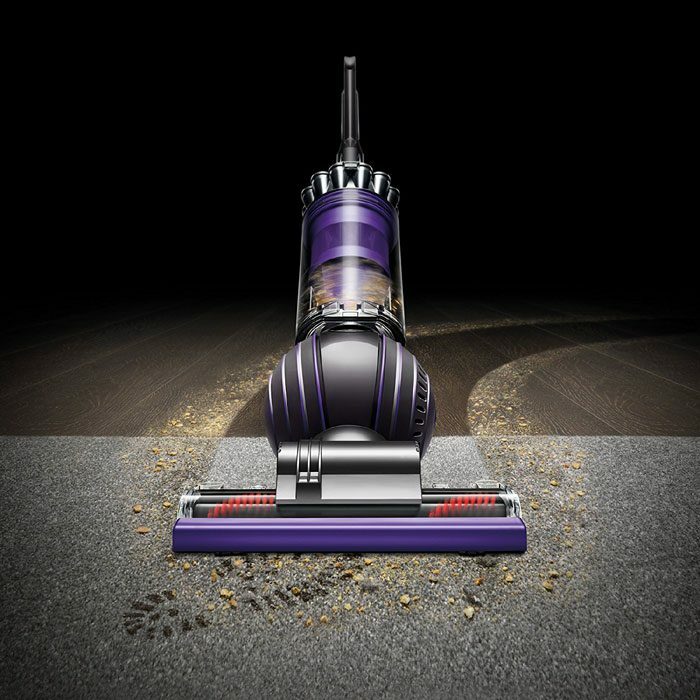 And the Dyson ball technology means the cleaner can be steered around the house easily. But at 17.4 pounds this is not a light vacuum. The Animal 2 comes with a very long long 35-foot power cord so you can clean a large area without having to switch plugs. And the extendable hose and wand that sits at the back of the cleaner adds an extra 15 feet of reach. In truth, no one can ever extend the hose to the maximum length the manufacturer claims – the vacuum either tips over or just springs towards you under the tension. The Animal 2 has the hose attached at the bottom of the cleaner so it won’t tip over but there is a lot of tension in the hose and I doubt you’ll feel comfortable extending to the full 15 feet. Even so you can realistically get a good 12-13 feet, which, combined with the 35-foot power cord gives the vacuum a very respectable reach indeed. One thing that still hasn’t been resolved on the animal 2 is the mechanism for locking the arm in the upright position so the cleaner will stay standing on its own. The ‘click’ is so quiet that you can’t hear it if the vacuum is running. You get used to using some force to make sure it’s locked into position but you’d think a guy that invented cyclone technology could come up with a better way to get a handle to lock into position! The dust cup is 0.55 gallons, which is excellent for a bagless upright. The bagless canister is easy to remove and empty. You just press a button on the handle which opens a door at the bottom of the canister and the dirt falls out. As is common with a bagless cleaner, not all the hair and debris will always fall out and you might sometimes have to reach in and take it out. The Dyson Ball Animal 2 has a self-adjusting active base plate at the brush head. This means you can move from carpet to hard floor and back again without having to change any settings. 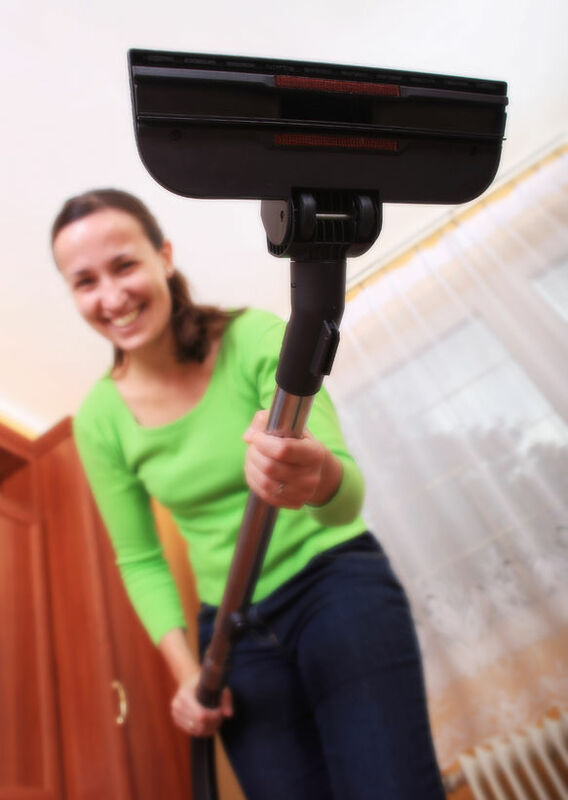 The vacuum automatically changes the configuration of the cleaning mechanism to suit the surface you’re vacuuming. This low profile is a great way to maintain maximum suction and it will clear all pet hair in its path on both carpet and hard floors. The only downside is that any larger pieces of debris on hard floors get pushed ahead of the brush head rather than going under and get sucked up into the vacuum. 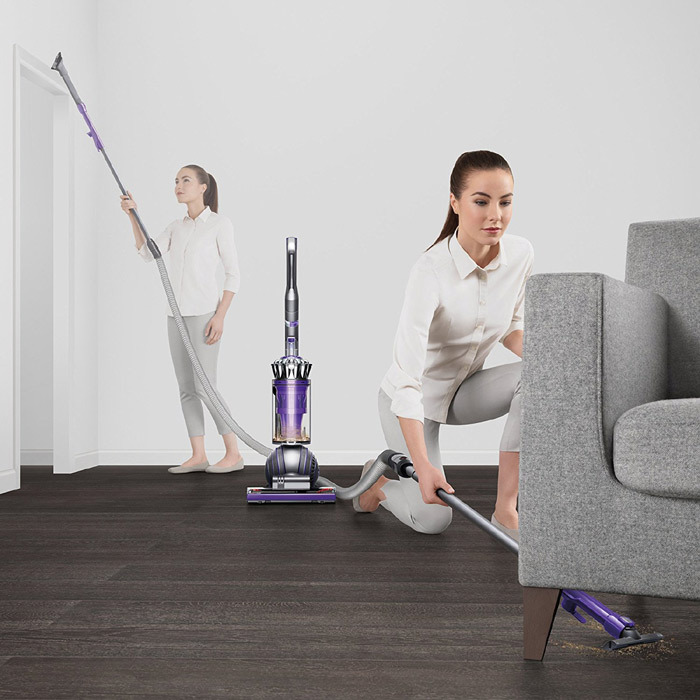 The Animal 2 comes with 3 tools as standard – a combination crevice tool and brush (it is switchable); a standard stair cleaning tool and the brilliant tangle free turbine tool. The video below shows how this tool works. You can also buy additional tools including a large articulated head tool for hard floors and a stiff bristle brush if you need to scrub a surface to remove dirt while cleaning. There is also a dog grooming attachment to brush and vacuum lose hair from your dog before it sheds. The Animal 2 comes with a tool holder on the vacuum to allow you to carry one tool with you as you move around the house. 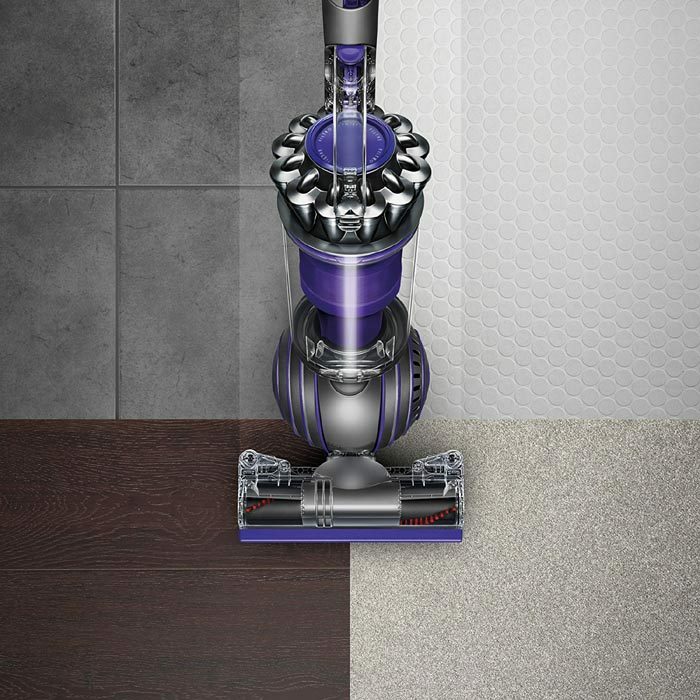 Along with suction power this is one of Dyson’s real strengths. The build quality of Dyson vacuums is always very high. The Animal has 2 washable filters – one before the motor and a HEPA one after the motor. The cleaner has been engineered to make sure there are now gaps, cracks or weak points in the cleaner or the tools. This means none of the air and microscopic particles that get sucked in are allowed back into the room until they have been filtered through the HEPA filter. 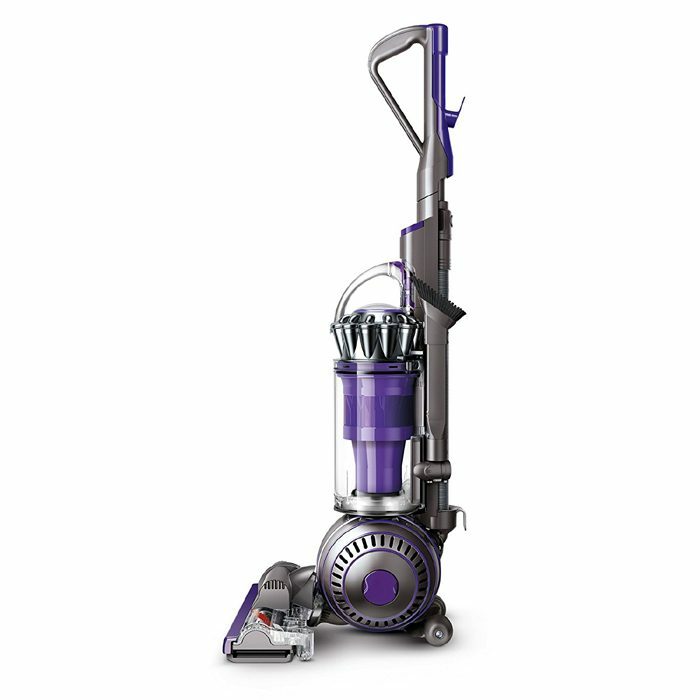 Dyson call this “whole machine HEPA filtration” and it works so well that it has been certified as asthma and allergy friendly by the Asthma and Allergy Foundation of America. There is no doubt the Dyson Ball Animal 2 Upright is incredibly good at cleaning dog hair. 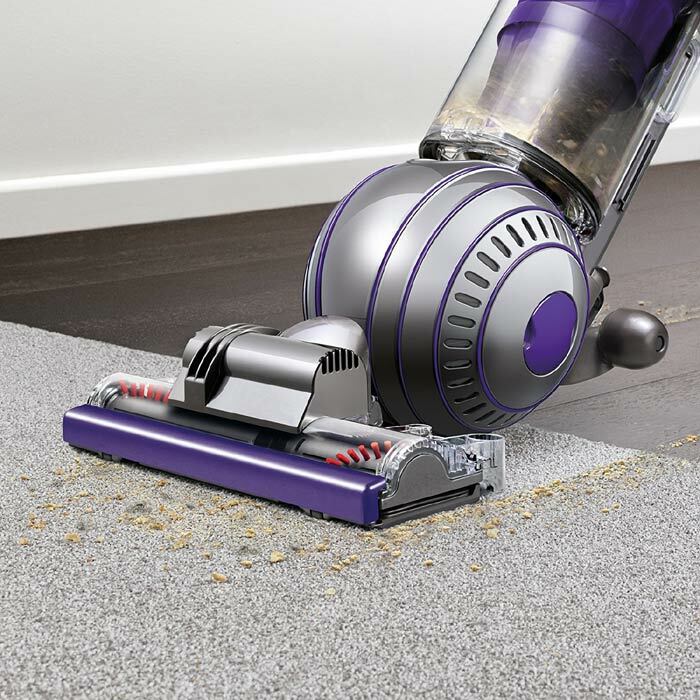 No company can match Dyson’s suction power and the new motorized brush roller makes carpet cleaning even more effective than the previous model. Of course, all that power is only good if you can utilize it. While it’s ‘ball’ steering mechanism is very versatile it takes some strength to tame this powerful animal. Most people won’t find this a great problem but for some it may prove too awkward and make cleaning more of a chore than it needs to be. 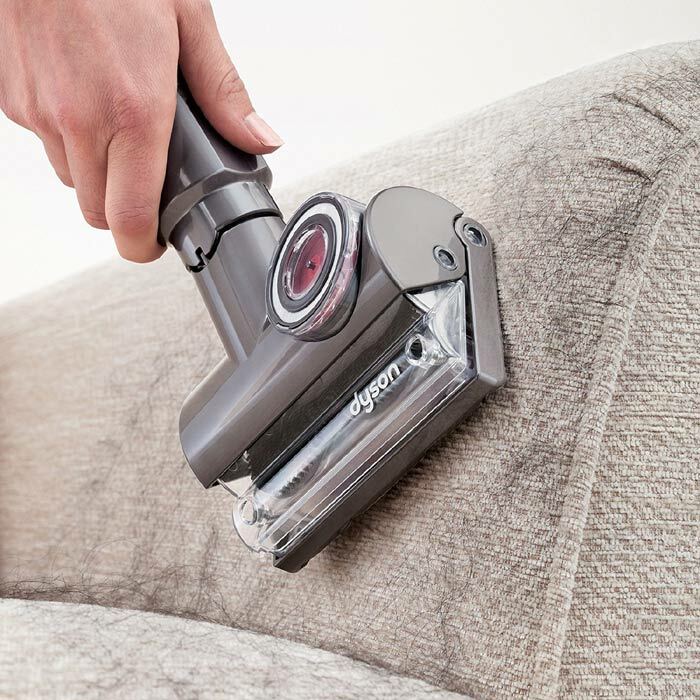 Anyone with shag pile carpets or lots of scatter rugs would also be advised to look elsewhere for a vacuum – the Dyson is just too powerful for these situations. But if these things aren’t an issue and you want to buy one of the most effective vacuums for removing dog hair and pet dander the Dyson Ball Animal 2 is an excellent choice. An incredibly powerful vacuum with wonderful pet hair cleaning abilities. But maybe get yourself down to the gym before using it on shag pile carpets!